This post is written as an IPython Notebook page, you can continue reading below or open it inside nbviewer. 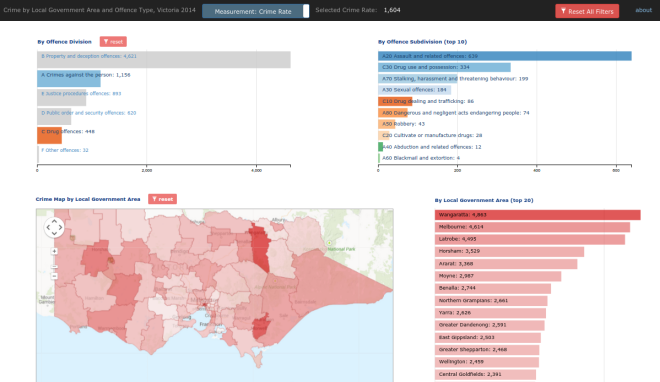 This App visualises Number of offences by geographic area (VIC, Australia) and offence type, year ending December 2014. The original data used in this application can be downloaded from data.vic.gov.au web site. The Application renders data as a multidimensional visualisation. All charts, including Crime Map are inter-connected and interactive, so you should be able to narrow down data to a subset of your interest within just a few mouse clicks. You can switch between Actual Offence Numbers and Crime Rate data views / measurements in the navigation bar.